The two medals awarded to British soldiers and sailors - and some civilians, including Canadian voyageurs - who took part in the 1884-5 Nile expedition. The Nile Medal, awarded for actions from 1882-9, has the clasp awarded to Sapper Mark Wright for being present with the expedition; had he fought in the battles of Abu Klea or Kirbekan he would have had clasps for those actions as well. The Khedive's Star shown here was also awarded to a participant in the campaign, with the dates 1884-5 in the band. Struck by Jenkins of Birmingham, it also has the date in Arabic in the Muslim calendar below, and on the clasp the star and crescent of the Ottoman empire on whose behalf - officially, at least - the British were fighting. The two Victorian campaign medals shown here were among my most prized artefacts while I was writing Pharaoh, and appear as illustrations in several editions of the novel. My 19th century protagonist is a Royal Engineers officer in the 1884 campaign to relieve General Gordon in Khartoum, and I was thrilled to discover a medal named to an actual R.E. sapper who took part in the campaign. These two medals were awarded to all British soldiers and sailors who saw active service in Egypt and Sudan from 1882 to 1889, and were dated accordingly. The date of this example of the Khedive’s Star, 1884-6, is consistent with the first medal, but because the star was issued unnamed the recipient can never be known for certain. The first medal, the Egypt Medal – one of the most beautiful of all British campaign medals – is more informative, not only bearing the clasp ‘The Nile 1884-5’ but also the recipient’s name around the rim: 17818 Sapper M. Knight, 8 Company R.E., one of the sapper units present throughout the doomed attempt to reach Gordon, and then in the months of fighting and eventual withdrawal from the Sudan that followed. The reverse of the two medals shown above, placed on a copy of the official history of the Royal Engineers in the campaign with the R.E. emblem in between. The first version of the Nile medal, created for the Anglo-French intervention in Egypt in 1882, had that year beneath the Sphinx, but once the decision was made to award the medal for subsequent campaigns the space was left blank and the campaign date put in the clasp instead. The obverse of the Khedive's Star shows his monogram surmounted by a crown. 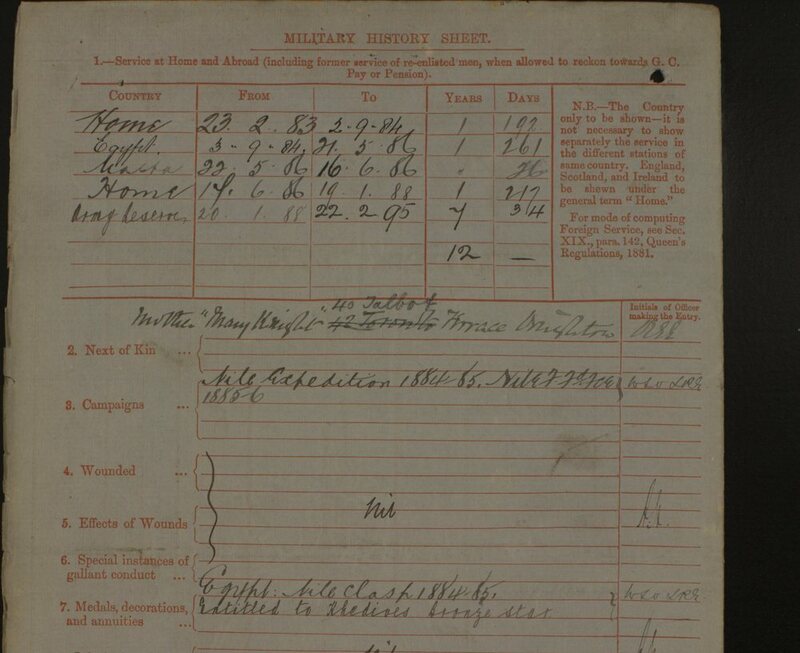 Part of Sapper Mark Wright's army record, showing his service in Egypt and medal entitlement. The work was not without danger: one of the company officers, Captain J.A. Ferrier, R.E., a veteran of the 1878-81 Afghan War, had the distinction of commanding the fort at Ambigol Wells in early December 1885 during one of the final actions of the campaign, when a force of some 700 dervishes cut the railway line to north and south and surrounded the oasis, reputedly shouting to Ferrier and his little garrison, ‘railway finish, telegraph finish, you finish.’ In a version of Rorke’s Drift in the 1879 Zulu War – an action also commanded by a Royal Engineer – Ferrier and his men defended their post against fierce attacks until a relief column arrived, the first of several actions over the final weeks of the campaign for which he was awarded the newly-created Distinguished Service Order. Reading his citation, I realised that this was the same Ferrier whose translation of a German book on the Franco-Prussian war is in my library – there because its editor was my great-great grandfather, Captain W.A. Gale, R.E., a colleague of Ferrier’s in the early 1890s when both were at the Royal Engineers Institute at Chatham. Whether or not Mark Knight was present at Ambigol Wells is unknown, as his service record doesn’t give that level of detail; but it seems likely that with his company he would have seen persistent skirmishing with the Mahdist forces over those final months as they toiled deep into the desert to the final station at Akasha, 87 miles from Wadi Halfa and well within Mahdist territory. His record shows that he returned from Egypt by way of Malta in June 1886, and then finished the remainder of his five years' full-time service before going into the reserve, finally being discharged in 1895 after having completed his twelve-year enlistment. He re-enlisted into the Royal Engineers for a year in 1900, when former soldiers were re-employed for home service to replace regulars who had gone to the war in South Africa. His papers show that he had returned to bricklaying after his first enlistment, and probably he did so again after his second; there’s no record of his subsequent life. As war in Europe loomed his medals must have seemed a memento of a distant Victorian adventure, yet it was one whose consequences - in fomenting fundamentalism in the Sudan and elsewhere, and renewing calls for jihad - were to play out bitterly into the future.